This Ramayana of Valmiki is a translation into English of the original epic poem depicting the life of Rama, an embodiment of supreme truth and virtue. Various versions of the story have been written. A Hindi Ramayana has been one of the most popular and influential books in the Indian sub-continent ever since it was composed by the poet-saint Tulsidas in the 16th century. 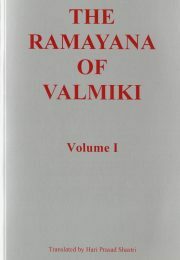 The Ramayana of Valmiki is much older and was written in Sanksrit. It is considered to be the original which Tulsidas re-told in the language of the people. This is a new translation of the entire work, by Hari Prasad Shastri. In the India where HPS grew up, ethical and spiritual education began for many with listening to recitations of the Ramayana. From this starting point, some would go on to study the deeper meaning of the epics and the revealed texts and take up meditation and related practices. The Ramayana was often read aloud by his own teacher, the mahatma Shri Dada. HPS dedicated much time and energy to making this translation. Apart from its literary and historical interest, the story expresses ideals of virtue in a way that can make an impression on the mind and give our thoughts an ethical and mystical turn. Some inquirers will find it interesting and helpful to imbibe the spirit of the Ramayana.